Adapted for the stage by Chad Beguelin, this show tells the tale of 'street rat' Aladdin falling in love with the princess of Agrabah, Jasmine, while the Sultan's wicked advisor Jafar is out to gain access to a magic lamp that can grant him three wishes. Unfortunately for him, only the 'diamond in the rogue' can enter the lamp's hiding place and, coincidentally, this is the very same young man who has the hots for the Sultan's daughter. While Jafar's evil plans don't quite pan out, Aladdin does get his hands on the lamp and with it three wishes that might just help him win over Jasmine. There's only one thing standing in the lovers' way: Jafar. He is determined to take control of the lamp and become the Sultan of Agrabah... dun dun dun. The epic theatrical adaptation of the classic Disney film is pretty close in plot and characters to the animation, with one of the biggest difference being that there are sadly no animal sidekicks (though Abu does get a nod in the show is a delightful way). Instead Iago is Jafar's assistant (rather than a parrot – but he's equally annoying in his human form) and Aladdin is joined by three best friends helping him out along the way (who were actually written for the original film but didn't make the final cut). These new additions fit into the show seamlessly and created some great banter along the way. The role of fan favourite the Genie has also been expanded for the stage show and rightfully so. Trevor Dion Nicholas started as the standby Genie on Broadway and originated the role here in London, and the part is absolutely made for him. He exuded happiness and joie de vivre, and his show-stopping solo made him the star of the night. Who needs seventy-five golden camels and fifty-three purple peacocks when you can have one big blue bundle of friendship? Excellent cast aside, one of Disney's Aladdin's strengths has of course always been in the incredible music by one of the greatest composers of all time; Alan Menken, and his iconic melodies run all throughout the show. Not only with the well-known songs from the film, such as Prince Ali, Arabian Nights, Friend Like Me and, of course, A Whole New World, but there are also some new additions that perfectly slotted in and of which the very moving Proud of Your Boy was the most significant. This song from Aladdin to his mum was written for the film originally and no longer quite fit when the storyline changed, but it suits the stage show wonderfully and added a real emotional layer on top of the rags to riches and good vs evil themes that run throughout the musical. The show was oodles of fun already, but with beautiful moments like that there was a real depth added to the story that elevated it from a charming film to an impressive stage experience. Aladdin really is a full-on epic spectacle. I haven't been as in awe with a set like the one for the Cave in Wonders in a very long time, and the magic carpet ride between Aladdin and Jasmine was another truly dazzling moment; showing us a whole new world of theatrical possibilities. 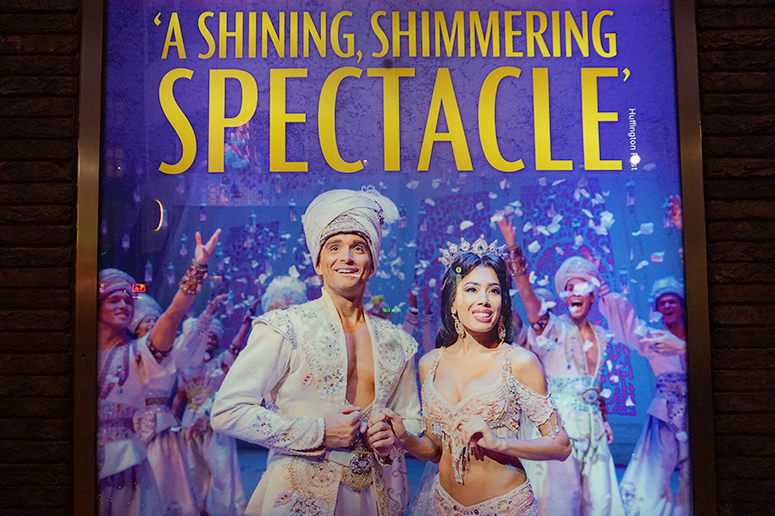 Whether you're in it for the nostalgia or you're simply looking for a good night out, Aladdin has it all – wildly impressive staging and set designs, super catchy tunes and, most of all, an incredible cast. The best way to spend an (Arabian) night! Couldn't agree more, saw it twice last year and would happily see it so many more times, I love the film, and love the show even more. I was in the front few rows both times and I am utterly convinced that the magic carpet was pure magic.